DID YOU EVER "MESS UP" YOUR DIET or skip workouts and think, “Well, I've already messed up, no sense in trying to get back on track. I'll start again on Monday.” For some reason we think it makes sense to be all or nothing when it comes to our diet, fitness, and overall health. Why? I think we tend to view fitness and nutrition as an option that fits in when it’s convenient. In order to make fitness and nutrition a permanent part of our lives, we have to think of it more as a responsibility to our health and wellbeing. Let’s look at the other responsibilities in your life. Things like sleep, eating, your career, caring for a family, etc. probably take high priority in your life. (as they should!) What would happen though, if you slipped up in one of these other categories? Didn’t get enough sleep, missed a meal, missed a deadline, or forgot something important related to caring for your family? Chances are you’d find a way to remedy the situation as quickly as possible. You wouldn’t just give up on sleep, eating, your career or stop taking care of your family because of a mistake or slip up. Doing so sounds silly, right? This is how we should be viewing our diet and exercise. So, you messed up a meal, indulged a little or missed a workout. No big deal! None of us are perfect (or that boring!). What makes a difference is what you do immediately AFTER the screw up, indulgence or missed workout(s). Don’t waste all your previous hard work by continuing to ignore your good habits for a few days, weeks or even months. Life is rarely convenient and if we wait until it’s “perfect” to get back on track, it may never happen. So, we need to be able to weigh our options, adjust our outlook, and make the best of the situation we’re in. Focus on what you can do now to get back on track. 1) When you’re first starting to make a change in your nutrition, numbers 1-6 are small behavioral changes you can make over time to adjust your nutrition lifestyle. Start at one and slowly turn the dial up every week or couple of weeks. Before you know it, you’ll be cruising around numbers 6-7. Numbers 9-10 again are for elite athletes or if you are training for something specific. It is not practical sustain a dial number of 9-10 long term in any part of our life, nor is it necessary for most people’s goals. 2) Maybe you’ve gone through dial numbers 1-6 and have been cruising around 6-7 for a while, but life has gotten a little chaotic. Look at the dial, and ask yourself which of these things CAN you do to keep you on the healthiest path possible for the time being. Your mental health is just as important as your physical health. It’s important to give yourself some time each day to reflect and let your mind wander. Again, life gives us plenty of excuses, but it is so important that we make time for quality time with ourselves and the ones we love. This doesn’t mean that if you have a deadline or a specific goal in mind for you fitness or nutrition that you can turn the dial down and get results. You WILL NOT get the results you are looking for without putting in some effort. What this does mean, is that when your exercise or nutrition needs to take a back seat to something else that is happening in your life, you can still make choices to prioritize healthier options that won’t completely derail your progress and hard work. For example, when you’re out to eat, you can still choose healthier options. Maybe you can squeeze in a quick ten-minute workout before you jump in the shower. Maybe today your exercise is parking the car a little further away and taking the stairs instead of your usual gym routine. This small change in outlook turns “I screwed up, guess I’ll figure it out later“ to “I accomplished 10 minutes today when I thought I wouldn't have time to do anything!” Or “I ate out all day today, but feel I made the healthiest possible choices.” You can’t control what life throws at you, but focusing on what you can control, helps to take the negative connotations out of your health and fitness goals. John says in his article, “If you can't do everything, what can you do?” Take a look at your day, week, month and make manageable decisions on what CAN be done. 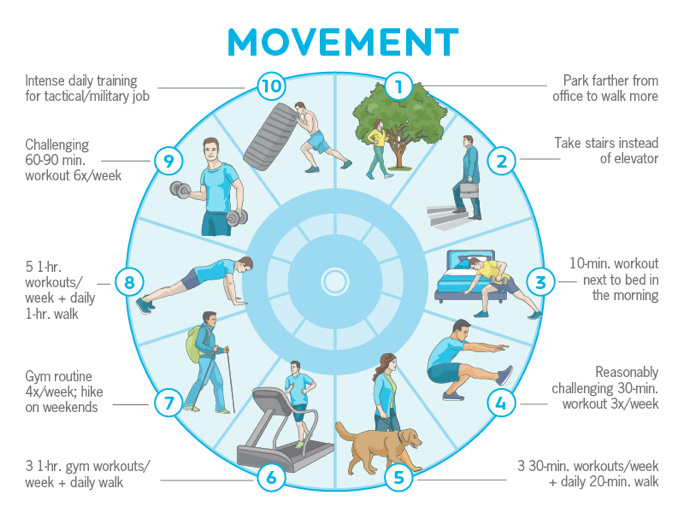 This may mean we have to adjust our dials monthly, weekly, or even daily, but eventually juggling life around our health and fitness will become as simple as juggling around any of our other daily responsibilities. It is also important to remember not to leave your health and fitness dials at a place that is too comfortable either. Once some of the other aspects in your life have shifted back in maintenance mode, turn that dial back up! Keep setting new goals and finding ways to challenge yourself both physically and mentally. Reach out to your IronPlate team if you need help. To read John Berardi’s article click here.